When it comes to the Corridors of Power, the World Cup organizer, FIFA, definitely comes to mind. Its stunning Zurich complex has two upper and five underground levels where the executive boardroom resides. 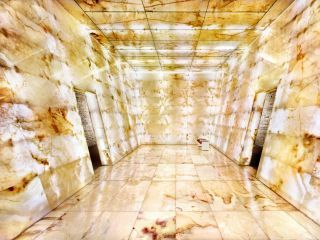 To access the boardroom, one descends many floors down and then passes through a long passage way of internally lit alabaster walls. The boardroom itself has been fortified so that no cell signals can pass through. The walls are made out of a polished metal which creates a dull sheen over the entire room. There is a large square table which sits under a huge chandelier ....the overall effect evokes obvious comparisons to the war room in Dr. Strangelove. 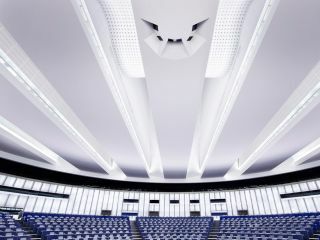 Photographer, Luca Zanier, has been shooting these spaces: board room, assembly halls and parliaments, where important decisions are made. His "Corridors of Power," is a series of these spaces where history is shaped.